The ultimate country/rock/funk/ bluegrass/r&b band! 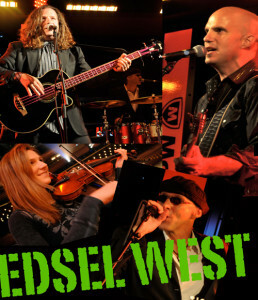 Comprised of an all-star cast of musicians, members of Edsel West have written hits for artist such as Montgomery Gentry, worked as in-demand session/studio players and toured the world, and shared stages with everyone from Sara Evans to Alice Cooper. Together they provide a dynamite show with the #1 priority of making sure you have as much fun as they do. Edsel West: impressive – yes; expensive – no! Only Edsel West can bring you a combination of Johnny Cash, James Brown, the Rolling Stones, Prince, Merle Haggard, The Commodores, the Allman Brothers, the Clash, Keith Urban and Springsteen and make it sound like they all belong together.